What's that you say? Chocolate, mentioned in an article on a health-conscious website, and touted as if it has actual benefits for one's health? Surely the Millennium is upon us. It's true. Chocophiles (lovers of chocolate) have reason to rejoice. According to recent research, at least some forms of chocolate (which we chocophiles consider the only "true" chocolate anyway) are actually good for you. One such study revealed that people who ate a small amount of dark chocolate daily were able to significantly reduce their blood pressure – by 5 points systolic pressure and 2 points diastolic pressure – while control groups who ate similar amounts of milk chocolate or white chocolate did not. Chocolate is, after all, a plant substance, related to and thus sharing the nutritional benefits of other dark vegetables. One of these benefits is the presence in dark chocolate (again, in dark or pure chocolate, not in milk chocolate or white chocolate) of high amounts of flavonoids, in particularcatechins, which are powerful antioxidants. We need antioxidants in our diet because they help us to fight the effects of aging. They do this by reducing the number of free radicals in the bloodstream, elements that increase oxidation, and thus contribute to heart disease and other health problems. Catechins also stimulate the production of endorphins, which are the brain chemicals that enable us to feel good and experience pleasure and a sense of well-being, and serotonin, which is the body's own natural antidepressant. So yes, all those stories you read about in the press that claim that popping a bite of chocolate can possibly do more for your sense of well-being than popping a Valium may be correct. The flavonoids in dark chocolate also help to absorb ultraviolet light, and thus protect the skin, increase the blood flow to it, and keep it hydrated. 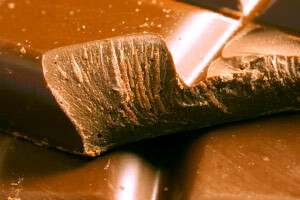 Dark chocolate has been shown to lower LDL cholesterol (the bad kind) levels by up to 10 percent. A recent British study showed that those who ate 7.5 grams of dark chocolate daily reduced their risk of heart attack and stroke by 39%, compared to those who ate .7 grams. In this study, more chocolate was actually better. This article is sounding better by the minute, right? Great. So I can binge on chocolate as much as I want, right? Uh…no. Sorry. Chocolate is still full of calories, and eating too much of it will still make you fat. In most of the research studies proving the benefits of dark chocolate, the amount of chocolate consumed by the test subjects per day was the size of one Hershey's Kiss. So, as with many things that are good for us, when it comes to chocolate, there is a point of diminishing returns – more does not mean better. Remember that one 100 gram bar of chocolate contains about 500 calories, and eating that much would seriously impact most people's attempts to either lose weight or keep it at a sensible level. If you were to add a full bar of chocolate to your diet, you'd have to balance those 500 added calories by cutting out something else. And, as "health news" goes, refreshing. Instead of being told that something we love to eat or drink is bad for us, we learn that something we enjoy is good for us. If eaten in moderation. If part of you still feels guilty over adding one small piece of dark chocolate to your diet, think of it as medicine, not a guilty pleasure. Like other forms of medicine, a little goes a long way and produces beneficial results, and too much can produce detrimental results. So rejoice that one of nature's sweet treats turns out to actually be good for us, but don't overdo it. Don't replace other foods in your already balanced diet with chocolate. Just add a little dark chocolate to that diet. Think of it as medicine that actually tastes good, gives you more energy and boosts your happiness levels, and that you can buy in almost any shop, as opposed to having to go to a pharmacy or health food store.